Great bike trails and fun for kids to explore! Campground Review: First let me say, I have stayed at this campground before and reviewed it so check out that other review for additional information as I am going to try to provide new info about the surrounding area. Horsethief is a standard BLM managed campground. It has well maintained and stocked pit toilets, an on-site camp host in the peak season, dumpsters for trash, picnic tables, metal fire pits, and marked and level tent spots. Each camp site has room for at least two vehicles and accommodates both trailers and tents. It does not have hook-ups but it is easily accessible by both pull behind trailers or RVs. This stay was in early November. It was busy during the weekend but was dead during the week. I think my husband was one of the only sites occupied during the week which makes for a quiet camping trip. It was also quite cold—dipping into the 20s at night. So if you plan to visit in October, November, or December prepare for cold even though you are in the desert. We had a little propane heater in the tent which was quite nice. One other difference between my visit in the spring and my late fall visit was it was not overly windy. There was a slight breeze on occasion but not the high winds we experienced in the spring. We love this campground and will definitely return in our multiple trips to Moab. One final thing to note, is this camp ground is either expanding or they are building another campground right across the road because of the increased demand for quality camping close to mountain biking. I don’t have an ETA on when the new loops will be open for campers but this is great news due to the increased visitors to this site. Horsethief Campground has become our go-to campground when we are coming to Moab to mostly mountain bike. As I mention in my other review, this spot it very centrally located and you can visit Canyonlands NP, Arches NOP, and Deadhorse State Park all within a 15 minute drive. However, the real convenience of this campground is its proximity to world class mountain biking. Every time we come, we see more and more sites filled with people with their mountain bikes in tow. We did bike this trip but because of the cold, we waited to bike until it warmed up a little bit. But anyway, this campsite is so convenient to world class mountain biking and trails for all ability levels. You can ride to Horsetheif, Mag 7, Navajo Rocks, Gold Bar (via Gemini Bridges Rd which is a dirt road), and you are a 10-15 minute car ride from the Klondike, Klonzo and Bar M trails. You can also easily arrange a bike shuttle for one way trips. My husband and I were able to do a shuttle between the two of us—we dropped the Jeep off at a trail head down the road, then over biked 12 miles to the car from our campsite then drove back. Super easy and convenient and the go-to site for mountain bikers. Product Review: As a Ranger for The Dyrt, I get the opportunity to test out gear from our awesome partners from time to time. This time, I was able to test out the Midland MXT275 MicroMobile base station. 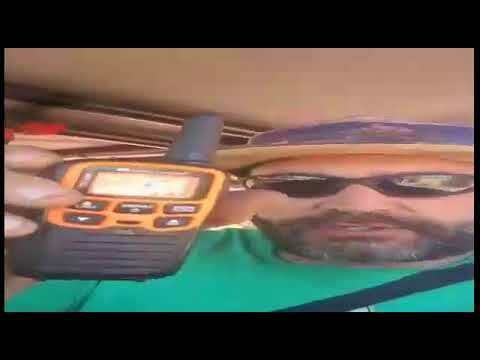 I have also had the opportunity to test out another product from Midland (the X-TALKER T51X3VP3 Two-Way Radio) which we used when testing out the base station. My husband and I installed this in our Jeep Wrangler which has been out fitted for rock crawling (hence why we are in Moab a lot). First impressions: this little unit was super easy to install and use right out of the box. My husband loves radios and communication devices and has a CB, Ham Radio, and now GMRS radio all installed in the Jeep. He was able to fit the small, and sleek device easily among all his gadgets without taking up too much space. You can hardwire the radio into the vehicle or just plug it into the cigarette lighter (12v power jack). We used the plug in so we can unplug it if we are not going to be using it for a while. One other benefit is it has a USB port which allows you to charge other devices (like your hand held radios) while driving. It has 15 channels—half of which provide a higher power transmit (since it does not have a mic gain) to improve range. It is also feels really durable considering it is a small, compact and sleek unit. We are not easy on our gear and we feel this unit will be able to take a beating. Usage Impressions: My husband was able to test out this in a variety of situations. He tested range with his friend who was sitting at home (using a non-Midland radio) in Heber City, UT and Jeremy was driving. He was able to get about 10 miles in this situation with super clear sound and transmission. We also tested range between two moving vehicles driving on Highway 6 to Moab. The jeep obviously had the base station and I had a handheld X-talker in my car. We were able to get at least 5 miles between vehicles while both were moving and going through the winding canyons/mountain passes. We were also on the higher channels which boosts the transmission signals. One huge bonus was the volume of the speaker. 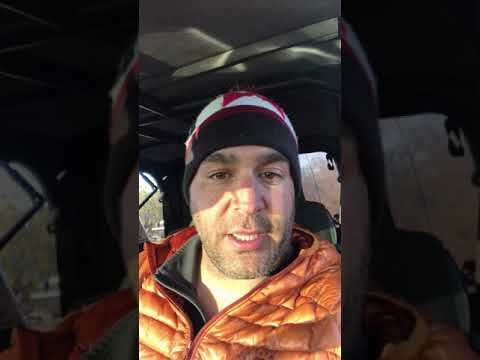 It was loud enough to be heard clearly over the elevated road noise of driving a lifted Jeep at high speeds on the highway. He came through super clear on my handheld and I couldn’t detect much of the surrounding noise. Overall evaluation: we love this little unit. It just allows us to have another means of communication when we are traveling in the backcountry and cell reception is spotty. The sound quality cannot be beat and has the same quality whether you are using another Midland radio or a different brand. How we foresee using this more in the future, is when we are backcountry car camping or hunting where we need to set up some type of base camp while we go out and explore. It will also be great when we are doing bike shuttles and people aren’t stopping at the same trail heads. If you are looking to get a non-handheld radio that has awesome range, clarity and durability for a great price—the MXT275 MicroMobile base station should be on your short list of options if not the only one. This is a Dept of Interior//BLM Campground. There are a number of restrooms avail. Cost is $7.50 a night for Senior National Park Pass holders; otherwise it is $15. Great picnic tables, fire rings and tent pads at all sites. Even though it was warm, the breezes made my two night stay pleasurable, internet access is intermittent. Horsethief is one of many BLM campgrounds in the Moab area. Most are along the Colorado River but this one is about 30 minutes from Moab on the way to Canyonlands and Dead Horse Point State Park. Arches is also easily accessible from here. There are almost 60 sites. There is no electricity, water or dump station, and there are vault toilets. Only complaint is that the large sites mean you get some big campers that need to use their generators. Generators are allowed between 8 am and 8 pm, but some people ignore that rule. It would be nice if the BLM divided a campground like this into generator and no generator sections. There are 3 loops here; it's large enough for that. Activities: mountain biking trails, 1.5 mile loop hiking trail with a nice view of mountains to the south. 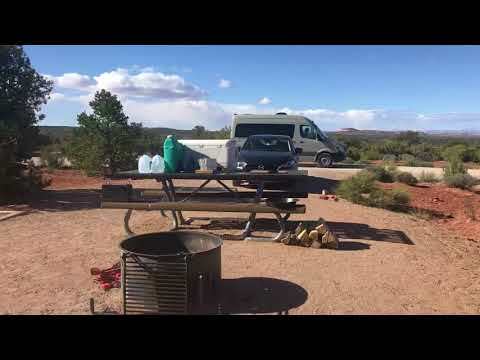 Campground Review:We stayed at the Horsethief Campground for 10 days in April. Horsethief is North of Moab between Canyonlands and Arches. This was a very clean and kept up campground with three loops and one way roads. The bathrooms are standard pit toilets but very clean and well stocked. The campground was sold out many of the nights we were there as people tend to head to the desert for a few days when ski season ends and you could not tell the heavy usage of the bathrooms. Camp host is very nice and there when you need them. Sites were close to each other but you didn’t feel on top of your neighbor or in a position where you didn’t have some privacy. Standard amenities: picnic table, fire pit, 2-car parking spots, tent areas or longer driveways to accommodate RVs or trailers. Obviously, some spots are better suited for trailers/RVs then others. There is also a campground dumpster which was awesome so you didn’t have to go to town to pack out your trash. The only negative is not really the fault of the campground but it was really windy many of the days. This made us alter our outing plans just a little and started to wear on our nerves/patience as cooking in the wind can be quite a challenge. This is definitely a campground we will return to when we visit Moab. The best part of the campground was its location to our desired activities. This trip was mostly for mountain biking then off-roading. There are so many awesome mountain bike trails right next to the campground that you don’t have to drive to a trailhead unless you want to. Even then, the trailheads are a 5-10 minute drive away. There are trails for all ability levels but definitely more options if you are an intermediate and above rider. You are also close to state and national parks and a 20 minute drive into Moab as well as close to many good Jeep trails. Due to the wind and my newness to mountain biking we ended up doing more in car activities then usual such as new Jeep trails, fossil hikes, and state park visits. 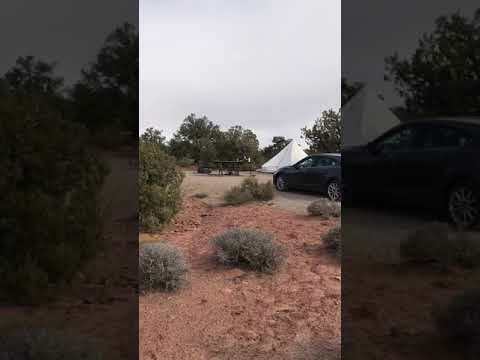 Finally, the campground is on BLM land so the roads pass through a lot of open range so watch out for cows crossing and being herded down the road. With the open range, the super fun part about visiting in the spring is seeing all the baby cows while you are driving in. As a Ranger for the Dyrt, I get the opportunity to test out gear from our partners once in a while. So, while we were at Horsethief, we got to try out the Midland X-Talker two-way radio three pack. We used these primarily when we were on our jeep trails. Since it is important to be in communication between vehicles when running a trail, these radios were awesome and worked as good as or better than a CB. Long battery life. These lasted longer than expected with just the factory charge. Clear audio. These were used in primarily close range but between vehicles and the sound quality was super clear—no static or garbled transmissions. We could even hear other people from across the river as if they were standing right next to us. *Good distance. Obviously the number of objects between radios can affect your distance but for what we were using them for it was great and I would feel comfortable having the radios farther apart and still be able to use them. We got a 3 pack! The more radios in use the more sites can stay connected. Easy to use. These radios have so many functions and abilities that it can get overwhelming but navigating the functions was pretty easy and the owner’s manual was clear. We got a 3 pack but the charging cradle only holds 2. This isn’t really a negative but does require additional planning if you want to use all three radios and ensuring they all have the same charge. Not really a con, but I may never utilize all the features that these radios offer, they are that awesome. We are super excited to have these radios as part of our car camping and general gear arsenal. Because cell phones don’t always work or have service (especially in the backcountry), having another form of communication is important. Being able to use these in the winter when snowshoeing or touring will be great or for jeeping, mountain biking, hiking, and hunting in the summer/fall. They are compact, powerful, and easy to use. On Utah 313, 12 miles from Hwy 191 Elevation 5800 and offering 56 sites and can accommodate RV's (no hookups). Great views for sunrise and sunset! All BLM campgrounds and camping areas have vault toilets, fire rings, are open year round, and a fee is charged / collected at self pay station at entrance. No firewood gathering (available at convenience stores in Moab). Camping at all sites is limited to 14 days within a 30 day period. Be prepared for wind. Ground is pretty hard and tough to get tent stakes in - we tied down to rocks on site. About a 15 min ride from Arches and about 30 min from Moab. A great place to get away form the crowds!